SL1168 Ultrasonic Flow meter uses the latest digital technology and low-voltage broadband pulse transmission. The instrument is tolerant of liquids with small amounts of air bubbles or suspended solids found in most industrial environments. With distinctive features such as high accuracy, high reliability, the MPU in the instrument provides unique digital signal processing and a relevant test programs. This clamp on water meter provides long-term no-drift measurements and sorts the operating software to adjust parameters according to changing conditions. The SL1168 ultrasonic flow meter delivers highly accurate and repeatable flow measurement for water ( water meter ) at a significantly reduced cost. Incorporating the core technologies of the SL1188 Industrial ultrasonic flow meter, the design of the SL1168 universal transit-time clamp water meter is focused on those features that optimize the measurement of water flows in irrigation, swimming pool, clean waste discharge, building services and other water applications. Ideal for pipes up to 48” (1200 mm) in diameter, the SL1168 ultrasonic flow meters promises accuracy to +/-1.0% of reading, repeatability of +/-0.3% of reading and a temperature range of 0 C to 60 C. High temperature sensors to 150 C are available as an option. The SL1168 ultrasonic flow meters offers low power consumption and high reliability at a very competitive price. An easy to read display and clear, user-friendly menu selections make using the instrument simple and convenient. It can be configured via a 4x4 keypad without additional programming devices and features a 20 x 2 digit alpha-numeric display. The SL1168 ultrasonic clamp on flow meters features a programmable frequency output, a relay output and a programmable current loop output. RS 232 and MODBUS RTU are standard, while RS 485 is optional. The SL1688 wall mount clamp on ultrasonic flow meters is packaged in a lightweight polycarbonate IP65 housing and includes clamp-on encapsulated IP 68 sensors that are easy to install and require no pipe cutting, thereby reducing installation and labor costs. Where pipes are found to be acoustically dead wetted sensors are available. Compact design, easy to install . SL1168 ultrasonic flow meters is equipped clamp-on transducers made with SiteLab patented technology, which is suitable for metal, PVC and other pipe materials, or lined pipe. The transducers use robust material with the high performance piezo electric crystals with high accuracy and good performance during measurement. At the same time, it's easy and convenient to install. 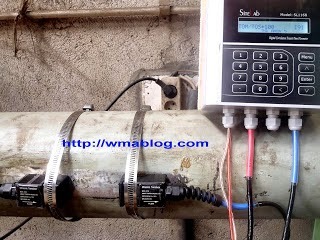 Users only need to fix it on the pipe with the pipe straps, and setup the transducer spacing according to the prompt calculation of the water meter. It only takes minutes to complete. Clamp on Ultrasonic Flow meters are installed simply by applying coupling compound on the bottom of the transducers and strapping them to the outside of the pipe. SiteLab Clamp-on Ultrasonic water meters are internationally known for their simple and convenient installation and low maintenance characteristics. V method installation on pipe size :1” to16”(25mmto 400mm).